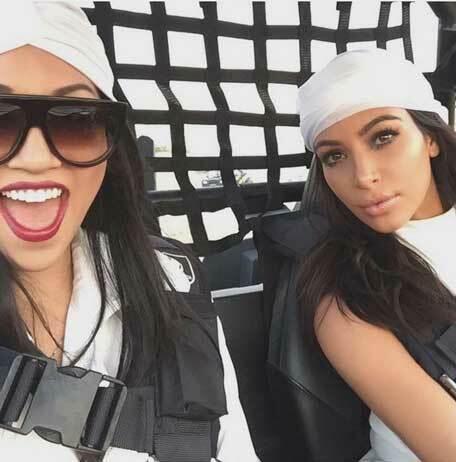 Kim Kardashian heading to Dubai for the biggest party in town? Looks like Dubai is all set to host the party of the year in October. The Kardashians will be heading to the emirates with their Beverly Hills gang to celebrate their biggest reality star Kim Kardashian's birthday. Kim has hinted on Twitter that she will be travelling to Dubai around October 21 to celebrate her 36th birthday. It's no secret that the Kardashians are a big fan of the UAE and never misses an opportunity to be in the bay. In 2011, Kim and her mother Kris Jenner flew down to the emirate for the opening of Millions of Milkshakes sending fans into a tizzy. Almost two years after Kim Kardashian stunned Dubai, her sister Khloé made an appearance in the city to launch their new fashion line for Lipsy at the Dubai Mall. And then in 2015 she gets into trouble on social media after sharing a selfie in a hijab. She had come to the UAE to make an appearance at a hair event inside the Dubai World Trade Center. In 2014, the 'Keeping Up With The Kardashian' star Kim was denied entry to India, she then jets into Dubai. Kanye West's wife came down to promote her new scent 'Fleur Fatale' and opening of Parfume Mode store on Dubai's Sheikh Zayed Road. Kim who made an earlier-than-expected landing in Dubai with her bevy of girlfriends got to doing what she is best at. Momanger Kris Jenner recently chose the region as her base to announce the launch of her new business venture – Legacy business school in Trump Tower, New York. That’s right, she chose Dubai not the Big apple to make the big reveal. Younger (half) sister Kendall Jenner also brought her entourage including Gigi Hadid and painted the town red.